Prospect Factory Wins First Place in Silicon Valley. Prospect Factory is one of the companies chosen by the Ministry of Economy of Mexico, through the TechBA program, to be part of the 5th generation of the acceleration program in Silicon Valley, USA. Prospect Factory was chosen to participate after the company concluded the pre-acceleration process with great success and was granted the certificate by TechBA for completing the four month pre-acceleration program. 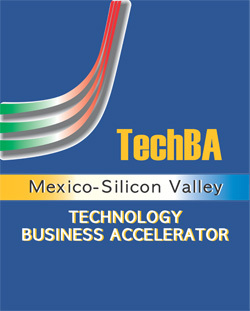 Every year, TechBA joins the efforts of the Ministry of Economy in Mexico to choose companies that can be candidates to receiving support from the official programs of TechBA to enter the global market. This year, 53 companies where chosen by TechBA and Prospect Factory was one of them. As part of the program, the company entered into an intensive program from January to May where a complete business plan was created. The market and competition were evaluated and a concrete value proposition was developed to take their services, already provided in Mexico, to the United States and start competing in global markets. The pre-acceleration process of TechBA ended in May in Silicon Valley. There TechBA met with the 23 companies that made it to the final week, evaluated their business plans and evaluated their sales presentations with the help of a very tough panel of judges. The final round required the participating companies to present their offer to consultants, local investors and high level executives from technology companies in the US. Ten finalists were chosen and then evaluated for a top prize. Prospect Factory ended in first place of the evaluation with the best sales presentation, as judged by the panel. Prospect Factory has already been accepted for the 5th generation acceleration program from TechBA, which will help the company increase its sales in the US and fine tune its offering as it becomes a key player in the search engine marketing arena.